The Scottish Ahlul Bayt Society (SABS) partnered with the Scottish National Blood Transfusion Service (SNBTS) in its international campaign; a life-changing and life-saving movement globally awakening humanity’s spirit of giving and helping endow the precious gift of life to countless in need. 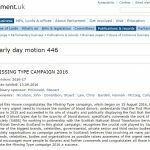 2016’s Missing Type campaign innovatively managed to raise awareness of the fundamental need for blood donation, and sought to tackle the shortage of supply by encouraging first time donors. 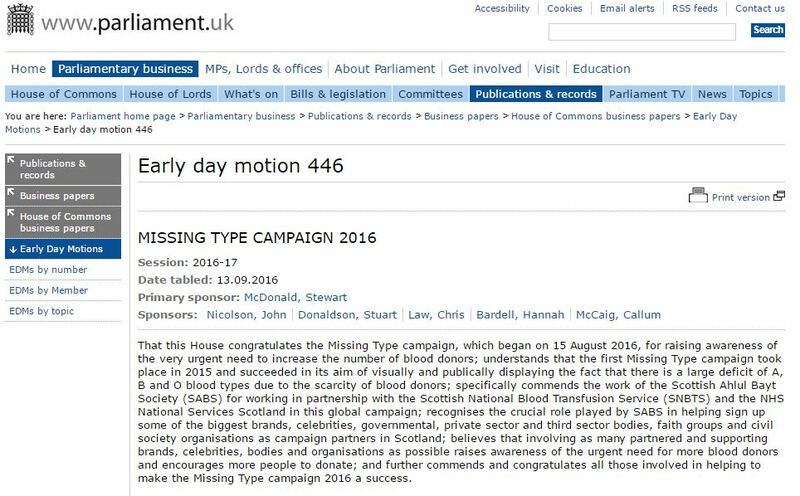 We are pleased to announce that the following Early Day Motion was submitted to the UK House of Commons by the Chair of the All Party Parliamentary Group on Blood Donation, Stewart McDonald MP, supporting the work of SABS and the SNBTS in this regard. The Scottish Ahlul Bayt Society is delighted to support the Scottish National Blood Transfusion Service in the international ‪#‎MissingType‬ campaign. Help us highlight the global need for blood donors. By removing the letters A, B & O (the blood groups) from key landmarks, organisations and people’s names, we are hoping to encourage more people to ‪#‎GiveBlood‬. People and organisations across Scotland are taking part in the International #MissingType campaign, removing the A’s, B’s and O’s from their signage and social media to highlight the need for new A, B, O and AB blood donors. The campaign comes after research from the Scottish Blood Transfusion Service (SNBTS) shows that the number of new blood donors in Scotland has declined by 30% in the last five years, and only 38% of Scots know their blood type. The statistics also demonstrate that despite the fact 96% of new donors are under 55, younger donors often don’t continue giving blood. This means SNBTS increasingly relies on donors aged 55 and over to make sure that there is always enough blood for patients. “The new research surprisingly revealed that many current donors are uncertain on their own blood type. Additionally, both donors and the wider public are unclear about how to find out what type they are. SNBTS believe that it is increasingly important that both existing and new blood donors know their blood group as not every donor can help every patient. “We have recently updated our website so you can see what blood types we need on any given day. If your blood bag volume is low, we really need your blood type. The Scottish activity is part of a global campaign, with letters disappearing from signage and social media in more than 20 countries, including Australia, America, Japan, Ireland, and the rest of the UK.